Compared to the carpet rolls, carpet tiles are much easier to maintain. The normal carpet rolls require a regular cleaning routine as it is more prone of accumulation of dust and germs. Carpet tiles come in different varieties with germ free and odor free options. Whenever a carpet roll is spoiled by spilling of liquid or any such reason, if the stain cannot come out, you either have to live with the stain, cover it, or get new carpet. 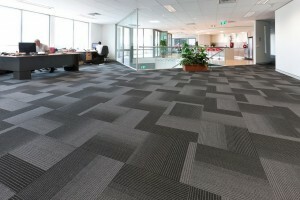 Carpet tiles give you the ability to simply remove individual tiles without disturbing the entire flooring. Owing to the easy to clean and maintain feature of these tiles, they are now being used excessively for commercial flooring at hospitals, institutions, shopping malls, hotels, schools, etc. 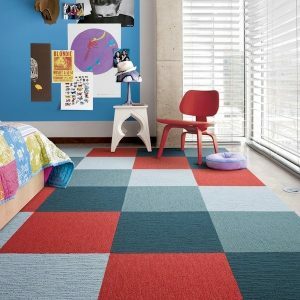 Carpet tiles are available in a wide variety of options to choose from. They come in a wide variety of colors patterns, shapes and sizes to choose from. There are countless possibilities of breathtaking designing options in a wide variety of color combinations. Variety goes beyond color and design. They are sold in different textures as well. Typically, 18 inches x 18 are largely used for commercial and residential usage. For those buying carpet tiles for residential use, 12 inches by 12 inches might cater to some. Such a wide variety of options help you to choose the most suitable option for your floor depending on your taste, requirements and budget. Carpet tiles are being made in a wide variety of materials ranging from coconut, sisal and other natural fibers, needle felt, nylon yarn. Some of the manufacturers are also coming up with environment friendly options like Nexterra Carpet tiles which are made with highest content of post-consumer recycled content – 85%. The tile’s backing is made using 85% post-consumer recycle material – material that would otherwise be sent to the worlds landfills. Such environmental friendly options are not readily available with traditional carpet rolls. Most people will find that installing carpet tiles is very easy. Unlike carpet rolls that requires a lot of skills such as cutting, measuring, and installing padding, carpet tiles can be installed on top of existing floors using special double-sided tape or glue. The padding is already a part of the carpet tile and is adequate as a noise and moisture barrier. With the included instructions, most room installs can be done in a single weekend. In the end, carpet tiles are a viable option for flooring, not only in commercial spaces, but also in the home. Many have found them to be great in play rooms and in the basement. If you are considering carpet for your home, before you settle on traditional carpeting options, take a look at carpet tiles.